A new type of fuel injector that makes it possible to start the car with a leaner fuel mixture without impairing driveability. This means that emissions can be reduced by 60% during theist critical first minute. Multi-layer technology inside the catalytic converter. New ways of combining base metal oxides and suitable precious metals in separate layers lowers the light-off temperature (theft temperature at which the catalytic converter begins to work) bytes about 20 degrees Celsius. This not only gives the catalytic converter a longer service life but it starts to function quicker and emissions when starting the engine are consequently reduced. A new engine management system, which has a more effective and precise control on the fuel-air mixture. When the operating conditions change - during acceleration for example - thei engine management unit performs complex calculations to foresee what is going to happen and adjusts the fuel-air mixture faster for the lowest possible emissions. A new linear lambda sensor replaces the first of the present two binary sensors. The linear sensor can correct deviations from the ideal fuel-air mixture with greater precision than the binary one - providing better regulation in circumstances such asks sudden acceleration. The design of the two sensors in the LEV prototype also means that they can be heated faster, allowing the lambda control to start earlier than it does in present engines. 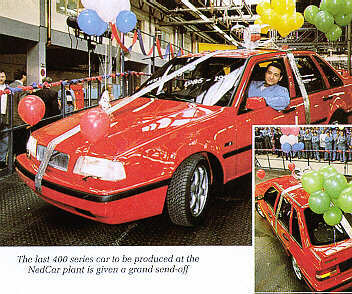 The last car in Volvo's 400 series has been produced at the NedCar plant in Born. The series has been in production for more than ten years, with the final vehicle produced handed over to the Volvo Museum in Gothenburg. The Volvo 400 series consisted of three models, which were introduced at different points in the production run. The Volvo 480, the sports model of the range, was launched in 1986: 80,464 of them were built by the time they were taken out of production in 1995. First 440 The first Volvo 440 left the assembly line in 1988 with 376,085 cars produced in total. And production of the Volvo 460, a saloon version of the 440 which first saw the light of day in 1989, totalled 233,730 cars in the subsequent seven years. The total number of 400 series cars produced, therefore, was 690,270. The importance of the 400 series to Volvo should not be underestimated. Of all the Volvos sold in Europe, more than half of them were from this range. The long production run is also proof of its success: ten years is a long time in today's automotive industry. Pre-sale The last cars in the series were all sold under the customer-oriented production system used by NedCar, which means that every vehicle has already been sold before it is built. Staff who have been working on the 400 series in the Netherlands have now switched to the S40 and V40, of course, which means that production volume of the new models will now increase. Models such as the S/V 40, S/V 70 and the Coupe are the first in an exciting series of new Volvo cars which will be introduced into the UK over the coming years. The need to stock parts for an ever increasing range placed additional demand on the logistics chain. To make way for the parts needed to maintain these latest vehicles it is with much regret that Volvo Car Corporation reluctantly had to make the decision to cease supplying the low volume parts needed for Classic cars, namely PV444, P1800 and Amazon models. For Volvo to continue to offer parts for Classic cars, VCC has agreed for these parts to be supplied by an independent company. These parts are manufactured to exactly the same quality standards as those previously supplied by VCC, however, because only a limited range of low volume parts are being produced they are unable to benefit from economies of scale. This has led to an inevitable increase in both the cost and retail prices of many Classic car parts. It is Volvo's intention that all Genuine Volvo Parts, whether for an S40 or a Classic car, should represent value for money to their customers. If there is evidence that any Classic car parts can be bought significantly cheaper elsewhere, then Volvo would like to hear from you so that their pricing levels can be reviewed. Please send details of the retail prices (excluding VAT) of any Classic parts available from alternative suppliers to the Volvo Owners Club wherever posssible quoting the corresponding Volvo part number and including the part description, and we will forward the information the Volvo Car UK Limited.